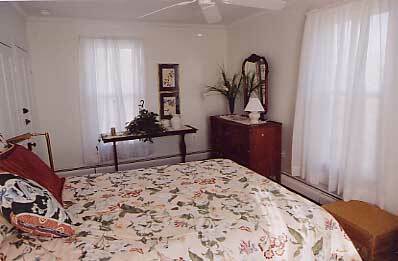 You can just feel the delight of spring and summer in this second floor front bedroom with a queen size bed. The pale green walls are accented by bright white trim and the ceiling is the original pressed tin. The gentle breezes and water views from the bedroom and bath are sure to make this room a favorite. Your private bath offers a glass walled tile shower.